Won't Last day without you - Sarah Geronimo and Gerald Anderson will be in perfect love team for the second time where they worked first worked together in "Catch Me, I'm in Love" early this year. 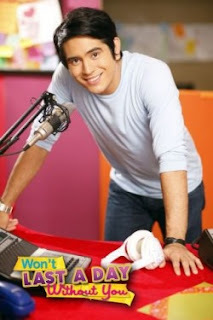 This is directed by Raz Dela Torre, "Won't Last A Day Without You" showing this . 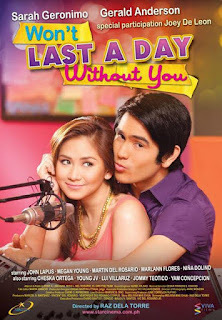 It is is the second team-up movie of Sarah Geronimo and Gerald Anderson where it is being release this coming November 30, 2011 and not November 23, 2011 as it is announced. According to this promising story, Won’t Last A Day Without You, must be experienced the joy and pain of falling in love. Both have charged it to experience. But they hope that the right Knight in Shining Armor will come along someday. After all, Sarah and DJ Heidee are like every woman who will not settle for less. 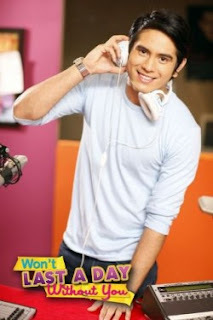 In the interview, unlike Sarah, Gerald misses having a special someone. Latest updates "Won't Last A Day Without You"